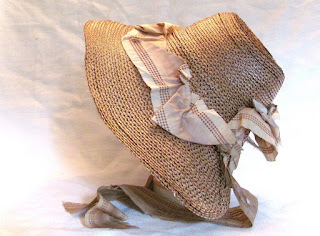 All The Pretty Dresses: Regency Era Straw Hat! This is a rare find indeed! 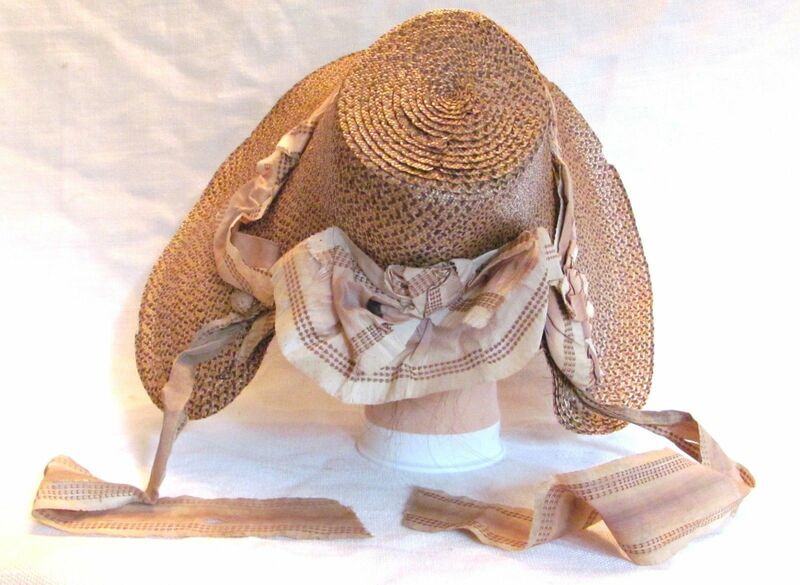 A straw hat like this would have been worn frequently; it obviously wasn't a special occasion piece, making it a rare find. A fancier hat that was worn for formal affairs may have been stashed away, but a piece like this would have been worn until it fell apart. Perhaps this dear lady met an early demise like so many women of the time. The fact that the straw is still in good condition is even more amazing. The brim is 7 inches wide at the chin and 5" wide at the top. The crown is also 5" high. 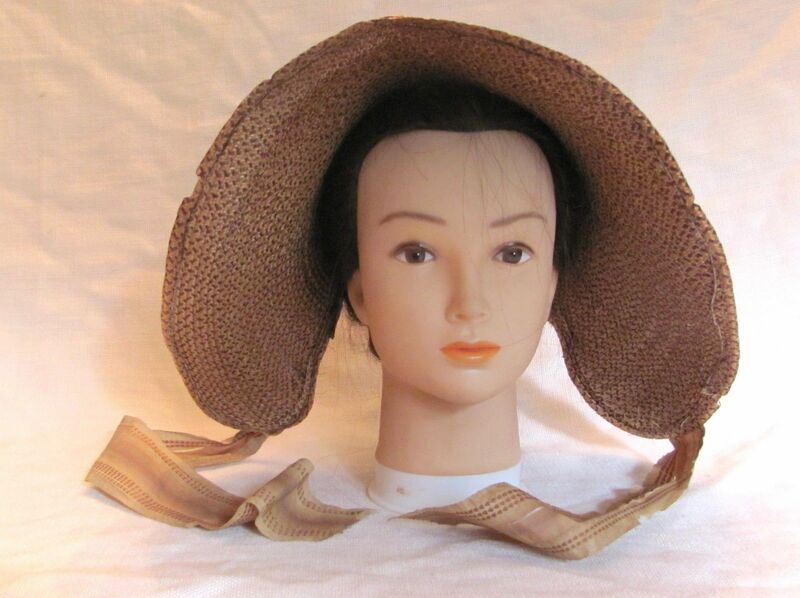 I tried it on and I think it would have been really annoying to wear it because it hides your face and blocks your peripheral vision, but of course it was the height of fashion at that time. Ladies weren't supposed to be gawking at everyone anyway. The original woven silk ribbons are still attached. The inside of the crown was lined with a soft webbed fabric, but this is torn. There is also a bit of vintage fabric sewn in the inside at the bottom of the hat where it would have rubbed against the neck--probably came from her scrap bag. Unfortunately, this hat was pressed flat when I bought it. I have restored it pretty much to its original shape, but the straw has some breaks in the front where it was flattened. 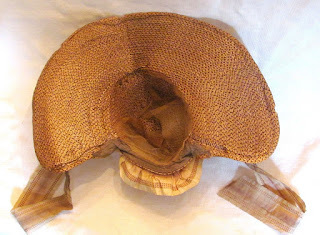 Although the straw braids are in very good condition for their age, the stitches holding the bands together are missing in many parts. It is all handstitched, no machine work at all. 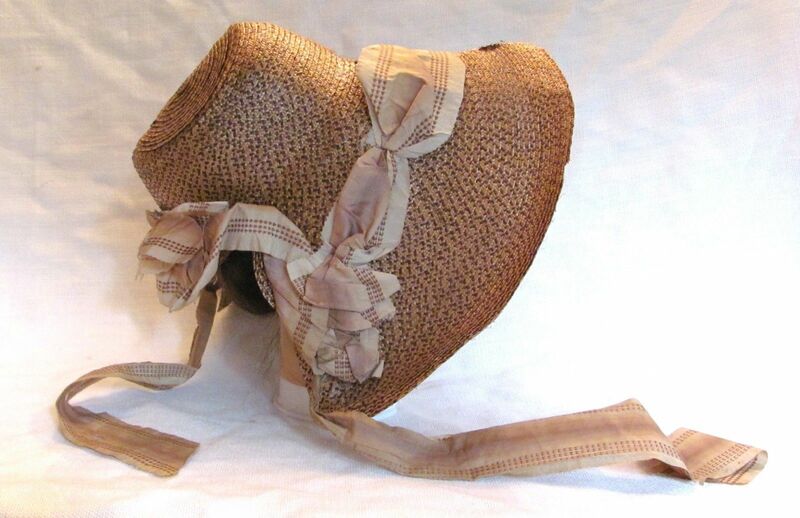 It's not a difficult job to restitch the hat, but it is a tedious one. However, it would be well worth the effort to further restore this beauty. 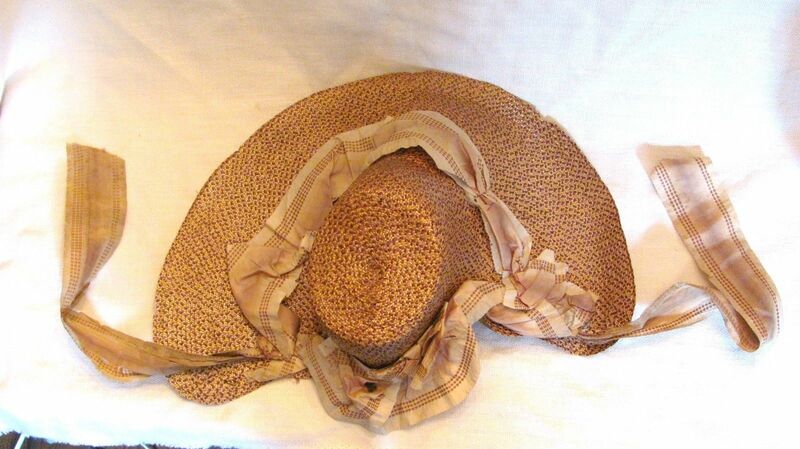 A lovely edition to your vintage clothing collection. Please look at my other listings for vintage Barbie clothing, English riding boots, a dressage show coat, jewelry and more antique clothing. 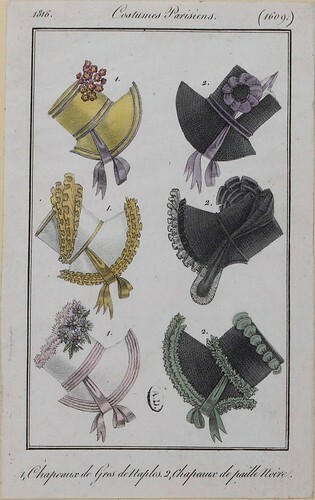 The above fashion plate is from 1816. I doubt I need to say much more.